Classic to Late Classic Period, circa A.D. 450-900. Remojadas Style and Region, Gulf Coast, Mexico.Ceramic sculpture. Provenance: The Steinberg Family Collection, acquired by Mr. & Mrs. Lionel Steinberg, Palm Springs, California in 1968. 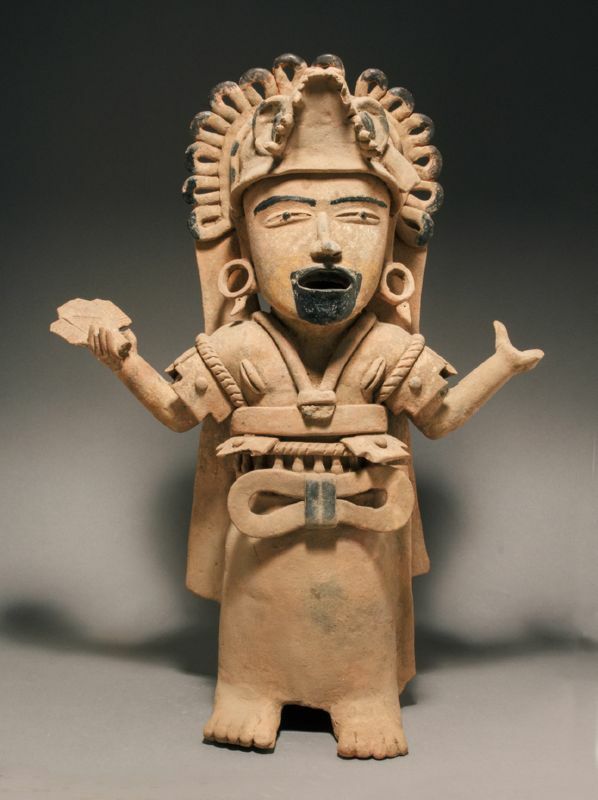 This striking figure of a priest with arms held outward from the body in a presentational gesture, his right hand holding a ritual object, perhaps a rattle, dons a complexly faceted jaguar headdress surmounted by multiple loops, his facial features accentuated by black applied bitumen (chapapote) pigment, the earrings with a tooth-like appendage below a jaguars toothy open mouth. His mid-section is adorned with straps and protective decorations similar to the sleeves above a knotted bow. The necklace appears to have fragmented its medallion. The trappings hang down to the shoulders, and the robe hangs down to the base of the feet.